Our product range includes a wide range of sandwich maker. As a quality driven enterprise, we are engaged in providing a beautiful range of Sandwich Maker. The provided maker is used for preparing sandwiches. Procured from authentic vendors, this maker is manufactured by highly skilled professionals using quality assured components and sophisticated methodology in accordance with defined industry norms. To ensure its functioning, the offered maker is duly checked by our quality auditors on numerous measures of quality.
. Low Power Consumption. Grilling function. Non-stick coating. Cool touch body. 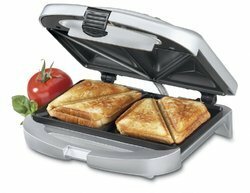 4 Slice General Aux grill sandwich maker. Warranty: 1 year on product. Power: 750 watts; Operating voltage: 210-250 volts. Includes: Sandwich maker and instruction manual. Has a Classy outer body. . Has non-skid feet. Product DescriptionThe Teflon grill plates offer a non-stick surface, making it easy to grill a sandwich. This appliance has a cool-touch body and can easily accommodate up to two bread slices. It also features a lid lock. Prepare a quick and healthy snack in the comfort of your home with the least effort. The toasting and grilling functions allow you to make an assorted variety of crisp and delicious sandwiches. This appliance has a cord length of 1.2 meters which lets you place at a distance from the power socket. This sandwich maker consumes up to 750 Watts of power. Grill A Sandwich Make the most delicious grilled and toasted sandwiches with the General Aux Panini Grill maker. 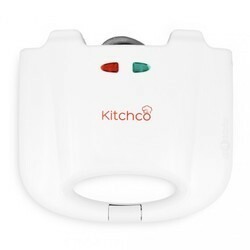 This device is user-friendly and safe, making it the perfect kitchen appliance. You can use multiple varieties of breads to grill or toast in this device. To prevent your sandwich from getting overcooked or burnt, this device comes with a light indicator which informs you of the progress of your sandwich. Its sleek, black body also comes with a lock to prevent it from opening while grilling. Non-Stick And Safe To Use The Nova Griller uses a non-stick plate to grill. Cleaning this device is now simple in the event of any spillage. Due to the grill plates, the sandwiches use less oil, making your meal healthy and fresh. This kitchen appliance is safe and user-friendly. It is built with a sturdy, heat-resistant body, keeping the outer body cool and safe to touch. Moreover, it also features an anti-skid base which prevents slipping and accidents. Looking for Sandwich Maker ?